Canoe trip can be booked separately. 3 nights hotel in Whitehorse (double occupancy ), 12 nights in 2 person tents, 7 nights in rustic log cabin, all required shuttles and transfers, introduction course in canoeing on swift moving water, canoes, paddles, lifejackets, complete cooking and camp gear, all meals during the canoe trip and the auxiliary program in Kluane, activities according to itinerary, experienced licensed guide, satellite phone on the canoe trip for your safety. Personal luggage, not used on the trip, can be stored at our place (Yukon Wild). Transportation to and from Whitehorse, meals while staying in the hotel, alcoholic beverages, optional activities, tips. The canoe trip is suited for a physically fit, ambitious beginners or more experienced paddlers alike. You learn the skills to navigate easy class 2 rapids and avoid sweepers and obstructions, but you have to put it to work yourself. You should be able to paddle (not float) 4 - 5 hours a day comfortably. For day hikes you should be in good physical condition. Walking time is approximately 5 hours a day, change of elevation appr. 700m. This trip is a treat for nature lovers who enjoy the outdoors. Experience the Yukon wilds away from civilization. Unforgettable wildlife viewings, the crackle of the campfire and learning new outdoor skills await you. 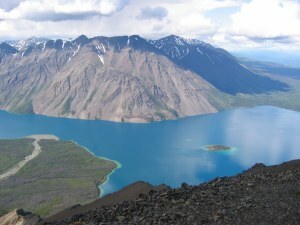 Stay in a log cabin at Kluane National Park and discover the wilderness in a small group with your professional guide. We start with the canoe trip on Quiet Lake. 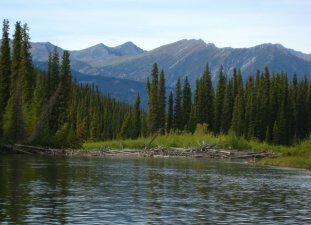 The following two smaller Lakes give ample time to get acquainted with the new element. For the next 11 days we follow the path of the Big Salmon River. Every day we move on, to set up camp at different locations. Over time we get used to the narrow river, tight bends and sometimes quick maneuvers. Sweepers and faster water alternates with more sedate sections. Seasoned paddlers and ambitious beginners alike will be inspired by this untouched wilderness river. As we float downstream we will be on the watch for moose and eagles. Beaver lodges are a common sight, and if we are lucky we'll see a beaver himself. Every month of the summer has it's special features. In June, we will have lots of water, moose cows and their calves stay close to the river for protection, and at night it never gets dark. Long daylight hours and warm weather mark July. In August King Salmon are coming up the river to spawn. The beginning of September changes the color of the vegetation to a carpet of red and gold - Indian Summer we call it. Besides the proper technique of canoeing, your guide will be able to tell you lots about wildlife, plants and traditional lifestyle in the wilderness. After the canoe trip Kluane National Park with its rugged, mostly glaciated mountains, will give you a totally different perspective of the Yukon. On day hikes we explore different areas of the Park . Starting on forest trails, through alpine meadows, along small mountain lakes, all the way up to vista points on mountain tops. In the distance you will see the vast glaciated landscape of the Saint Elias Mountains . At the fringe of Kluane lies the small community of Haines Junction. Activities like Glacier Flights, or a Whitewater Rafting Trip on the Tatshenshini River start from here. Arrival in Whitehorse, pick up at the airport, transfer to your hotel. In the evening introduction to the other participants and briefing about the upcoming trip. Instead of starting in a hurry, we use the second day to let you wind down and take in the atmosphere of Whitehorse and it's frontier attitude. You have time to explore Whitehorse on your own. Visit the sternwheeler, the fish ladder, historic buildings - and maybe Canadian Tire. You might want to do some last minute shopping or just sit on the banks of the Yukon River and wonder what lies beyond. Surrounded by the rugged mountains of the Big Salmon Range the small lake system makes us feel at home in the wilderness right away. On small connecting streams we paddle from one lake to the next. At night a loon might cry across the water surface. Starting as a small creek, the Big Salmon River has clear water and some tight bends with driftwood obstructions. The river widens and small tributaries with gravel bars invite for frequent stops. After each bend, the scenery seems to change. Slower sections are great to enjoy the vistas, while the odd log pile gets us back into action. Fishing and foto stops break up the day. Setting up camp at a new location every evening becomes a daily routine. On the campfire your guide will create a delicious meal. We have one optional rest day for a short hike, relaxing in camp, or building a sweat lodge in a traditional way. By now, the Big Salmon meanders through more open poplar country. Swift choppy water on the last day on the Salmon River makes up for some excitement. Way too fast, it seems, after 250 km we reach the Yukon River. From here on, we float down the River, with occasional stops. Relicts from the times of the gold rush are always interesting to explore. Fallen in log cabins, gold dredges and other mining equipment are all that remains of those heydays, more than 100 years ago. A native cemetery at Little Salmon is a last stop, before we reach the village of Carmacks, where we end the trip. Here we get picked up by our van, and drive back along the Klondike Highway to Whitehorse, from where we continue with the second stage of the journey, Kluane National Park. Clients just taking part in the canoe trip, will stay in Whitehorse at the hotel. From a wilderness log cabin, being our base camp, we start the day hikes. On different trails we explore the variety Kluane has to offer. Starting in the boreal forest, we reach alpine meadows and vistas of the ice covered mountains in the back. Dall Sheep an Grizzly Bears are famous for the park. Kings Throne at Kathleen Lake is one of the most spectacular hikes in the area, overlooking several lakes in the vast valley and beyond. Alpine wildflowers are delicate beauty's in the harsh environment. In the fall the red and golden vegetation is a sight nobody will ever forget. On our drive up the Haines road we get into the tundra. En route we stop at a traditional native fish camp in Klukshu of the Southern Tutchone Indians. Looking at Salmon fishtraps and eagles is as interesting as talking to the elders about their traditional lifestyle. A little drive away is the huge Kluane Lake, fed by the Kaskawulsh Glacier. The trail branches off towards Sheep Mountain, home of a large number of Dall Sheep. Red Castle Ridge on the other side of the draw got its name from the iron colored rocky cliffs. A sudden drop signals that we have reached the top of Sheep Mountain. Right below us expands the turquoise water of Kluane Lake and the snow covered mountains rise in the back. Today we check out the Visitor Information Center in Haines Junction with great displays about the park. A glacier flight, to get you into the heart of Kluane National Park. From above you can see the largest non polar icefield of the world. If this seems to much for you, relax at the cozy log cabin, or go for a walk along the Dezadeash River.